Housing and Urban Development (HUD) Secretary Ben Carson has heard us! He has taken steps to roll back at least some of the worst components of the Obama-era attacks on private property and federal overreach. Specifically, HUD announced that it is withdrawing use of a computer assessment tool that maps every single neighborhood to gauge if the community is in compliance with “fair housing” grant rules. This “tool,” enforced by HUD, has made every community which applies for its grants to complete an “Assessment of Fair Housing,” using its computer program – or “assessment tool” to identify all “contributing factors” to housing discrimination. The information to be gathered includes a complete breakdown of race, income levels, religion, and national origin of every single person living in the community. HUD then uses this information to determine if the neighborhood meets a preset “balance,” determined by HUD. The community is then obligated to do this assessment every five years! To produce the community’s plan for compliance, HUD rules demand that a wide array of “interested parties” participate in its creation. Guess who they are?!! Planners. Civic activist organizations. Affordable housing developers. In short – all the people who have a stake in gaining political power or big bucks from the grant programs. This is nothing but social engineering of every neighborhood in America. Remember, just a few weeks ago I warned of cities like Minneapolis and the state of Oregon taking steps to eliminate zoning protections for single family homes. That assault on private property is a direct result of the HUD AFFH regulations. The goal is to eventually force everyone into stack and pack high rise apartments in the name of Sustainable Development Smart Growth. It is the destruction pf private property rights and property values. And it is a ploy by the federal government to dictate policy over local office holders. Secretary Carson is trying to take action to roll back this outrageous federal overreach leftover from Obama and restore private property protection. Secretary Carson knows that the only true fair housing is private property in which the owner is able to build personal wealth. That is the only true way to eliminate poverty – not social engineering that damages the rights and futures of everyone! But those powerful Non-governmental organizations (NGOs) like the National Fair Housing Alliance are outraged and have filed a law suit to stop Carson. Two months ago, when Secretary Carson asked for public comment on his plans to roll back the AFFH rule, APC submitted 1,000s of comments from our supporters opposing the very existence of the rule. He heard us. He is trying. But he is being blocked every step of the way by those socialist forces who are determined to destroy the very existence of private property along with your ability to choose where and how you want to live. According to these social engineers, for you to live in a home of your choosing is now racist and a social injustice! My American Policy Center (APC) is one of the only groups in the nation fighting for the protection of private property. I am sounding the alarm. I am teaching local activists how to fight back. I am reaching out to local and state officials to warn them of the trap if they accept these grants. If you would like to support Tom DeWeese’s efforts, you can donate here. This entry was posted in Federal, International, Local, State on April 17, 2019 by GSF. In another insightful piece by Kathleen Marquardt of the American Policy Center, she speaks about form-based code, AGenda 21 / Agenda 2030, and the planned society of the future. “A form-based code is a land development regulation that fosters predictable built results and a high-quality public realm by using physical form (rather than separation of uses) as the organizing principle for the code. A form-based code is a regulation, not a mere guideline, adopted into city, town, or county law. A form-based code offers a powerful alternative to conventional zoning regulation. The Wildlands Project is another offshoot of Agenda 21 / Agenda 2030. This entry was posted in Federal, International, Local, Miscellaneous, State on April 3, 2019 by GSF. Call it what you will — Agenda 21, Agenda 2030, The “Green New Deal”, United Nations SDGs, Sustainable Development, Livable Cities, “New Urbanism” — it’s all just socialism/fascism/corporatism and the goal is to control people, not make their lives better. Related: Phyllis A. McKenna | The Equality of Socialism: All Equally Miserable is spot on with her observations and clear explanation. This entry was posted in Federal, International, Local, Miscellaneous, State on April 1, 2019 by GSF. “Most people in America don’t even realize that tentacles of a dangerous United Nations program are being enacted in our nation’s cities and certainly our country, with the full cooperation of those in our highest positions of authority. It is so complicated and difficult to believe that many simply dismiss it, considering it just a conspiracy theory. But even a cursory investigation reveals it is very real and the evidence is easily attained. This entry was posted in Federal, International, Local, Miscellaneous, State on March 29, 2019 by GSF. Yes, the Green New Deal was voted down in the Senate. But that is only the beginning of the fight – not the end. Alexandria Ocasio-Cortez’s Green New Deal has hit this country like a ton of bricks – and it’s the best thing that has ever happened to our efforts to expose the tyranny of Agenda 21 policies. Now, I have discovered an explosive new document hidden on a French Non-governmental organizations’ (NGO) website. Yes, France has its own Green New Deal, and foreign NGO’s are often more open and honest in their intentions than American NGOs who hide their real goals in innocent-sounding rhetoric. And remember, these Agenda 21/Green New Deal policies are GLOBAL. The whole world is targeted to enforce these policies. Remember, I warned that under Smart Growth programs now taking over every city in the nation that single-family homes are a target for elimination, to be replaced by high-rise stack and pack apartments in the name of reducing energy use. The Green New Deal calls for government control of every single home, office and factory to be torn down or retrofit them to comply with massive environmental energy regulations. The Green New Deal calls for the elimination of the internal combustion engine. Most recently I warned that the beef industry is a direct target for elimination. It will start with mandatory decreases in meat consumption until it disappears form our daily diet. The consumption of dairy will follow. Since the revelation of the Green New Deal, the national debate is now over cattle emissions of methane and the drive to eliminate them from the planet. Controlling what we eat is a major part of the Green New Deal. Instead, they are now openly revealing that their real goal is socialism and global control, just as I’ve been warning about for these past twenty seven years. Now they are determined to take congressional action to finally make it the law of the land. Keep in mind, each of the quotes in bold above is from a real document detailing the extent of these tyrannical policies intended to destroy our culture, control how you live, and what you eat. Over these years elected officials have listened to the Sierra Club, the Nature Conservancy, the World Wildlife Fund, ICLEI, the American Planning Association, and many more, as they assured that their plans were just environmental protection – just good policy for future generations. Well, now the truth is right in front of you. There is no question of who and what is behind this. And no doubt as to what the final result will be. The Green New Deal has laid bare the horrible reality of my warnings. 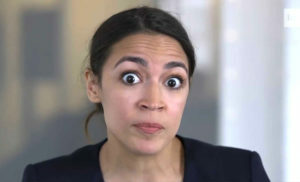 New York Congresswoman Alexandria Ocasio-Cortez has unwittingly given you and me the weapon we have needed to destroy Agenda 21. Finally Americans across the country are talking about it. Now many more can see the truth to my dire warnings. Now is our time to strike with everything we have to stop it. I am leading that fight. I have won some incredible victories against them to protect property rights and push them back. But I am facing a massively funded enemy. Your support is what keeps me going. Over the past two years you have witnessed how these power mongers will lie, cheat and steal to keep control over your life. You now have positive proof of how far they are willing to go to keep that power over you. Many Americans are now waking up to this threat. With your support I can teach them the dangers and get many more to help us fight. If you would like to support Tom’s efforts, click here. This entry was posted in Federal, International, Local, Miscellaneous, State on March 28, 2019 by GSF. We marvel at the fact that we are often joined in our local efforts to put a halt to high-density and other features of the “new urbanism” agenda by those who vote at the federal and state level for the very people and policies that are causing the problem locally. As we have already seen in our NH towns, the “new urbanists” don’t just want to plan how streets are laid out, they want to control where you live, work, and play, and how you travel and communicate, even how you socialize. It is reminiscent of the model of the planned society of the future. In NH we see the push for sidewalks, bike lanes, and commuter rail. Smaller lot sizes, bigger buildings, and transit-oriented development. Bedford and other towns are currently fighting the “stack and pack” mania…and we’ve even seen other states that HAVE actually passed ordinances against single family zoning! In Bedford they invited the World Health Organization, AARP, SNHRPC/APA, and other private, unelected, and unaccountable organizations pushing for housing changes from out of the area. NGOs and private corporations are running the show, unbeknownst to the voters who still think they have local control. The only way to stop this is at the local level, and by NOT voting for it at the State and Federal levels. Will those folks who have joined us in the fight against high-density but still vote for the Agenda at the State and Federal levels ever figure this out? This entry was posted in Federal, International, Local, Miscellaneous, State on March 4, 2019 by Admin. For those who don’t want to admit the UN has become an overly powerful behemoth of an organization, behold the fact that it now wants to create a ‘world government’ to replace the governments of individual countries. It has even been said that the EU is the ‘new Soviet’. Does America really want to be part of this? This entry was posted in Federal, International, Local, Miscellaneous, State on February 28, 2019 by Admin. Still Wondering Where This Comes From? We are stunned that otherwise educated people still claim not to know of any ‘agenda’ of the United Nations and the myriad of groups, committees, goals, and conferences it has created to which the ‘ad hoc’ group is attempting to get the world to submit. The Global Agenda of Local Governments lays it out in clear language. As a result of the growing links between global and local challenges, local and regional governments now play a greater role in the regulation of the urban fabric and territories, and the protection of the commons. This entry was posted in Federal, International, Local, Miscellaneous, State on February 10, 2019 by GSF.